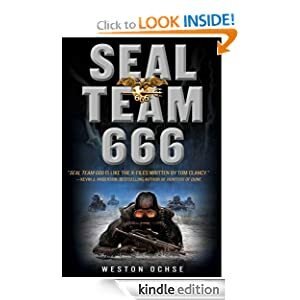 With Seal Team 666, my friend Weston Ochse has merged horror and military fiction into a new genre. When Soldier of Fortune Magazine touts your writing ability, as it did Ochse, a new age of military fiction has emerged. Ochse, a fellow Arizonan, is known for his often strange and thought-provoking works, such as his Bram Stoker Award winning Scarecrow Gods, Velvet Dogma, Blood Ocean, or my favorite, Empire of Salt. His hundreds of short stories and novels reflect his military intelligence background, his martial arts training, his degree in Oriental Studies, and his love of fine foods. Seal Team 666’s main character, Jack Walker, is removed early from his seal training and thrown headlong into a special unit designated Seal Team 666. Their mission is to track down and eliminate supernatural enemies of the United States. Walker’s possession by demons as a child has left him with the ability to sense demons, a useful tool if only he could control it. Since the presence of demons freezes him into inaction, it might cost him his life. Ochse, a lover of large canines (He and his wife Yvonne Navarro own three Great Danes), has added a Belgian Malinois dog, Hoover, as a member of the team. Their quarry, Chi Long, is the leader of a cult that yearns a return to power of the ancient Karen Empire of Myanmar. Using the skins of humans to construct a suit capable of withstanding a demon’s power, he leads the team through a maze of subterfuges and false leads, finally culminating in a warehouse battle in Burma, now known as Myanmar. Facing almost indestructible stone creatures that come to life through the blood sacrifices of others, an army of crazed zealots, and a demon-possessed madman, Seal Team 666 faces its greatest challenge. When most of the team is captured, it is up to Walker and Hoover to find and free them. Seal Team 666 is full-auto action from page one until the last page. I give it 5 Stars.